PRDM16 regulates cold-induced peroxisomal biogenesis in adipose tissue. (A) Gene expression analysis in BAT, iWAT, and gWAT of WT mice kept at normal room temperature (RT) (22°C) or subjected to cold (4°C) exposure; n = 3–4. (B) Fluorescence microscopy analysis of COS-7 cells transfected with a GFP reporter under the control of a –2 kb Pex16 promoter alone or together with HA-PRDM16. Original magnification, ×20. (C) Luciferase reporter assay in COS-7 cells; n = 3. 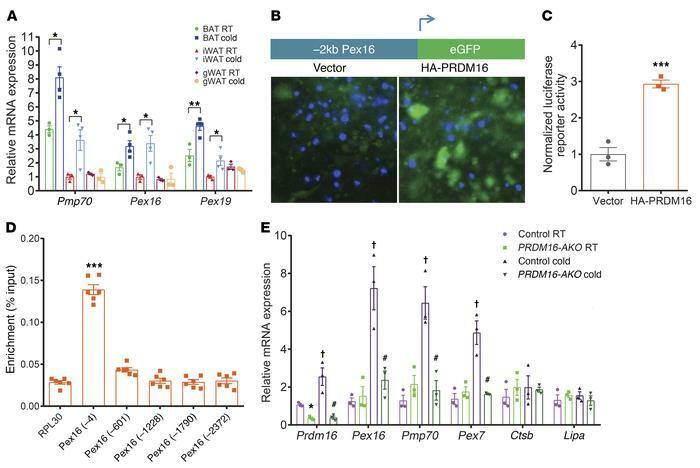 (D) BAT SVF cells expressing retrovirally encoded FLAG-PRDM16 were subjected to ChIP assay using an anti-FLAG antibody followed by qPCR using primers to amplify various regions of the Pex16 promoter; n = 6. *P < 0.05; **P < 0.01; ***P < 0.001. (E) Gene expression analysis in iWAT of control and adipose-specific PRDM16-KO (PRDM16-AKO) mice; n = 3. Data are expressed as mean ± SEM and were analyzed by Student’s t test. †P < 0.05 versus control RT; #P < 0.05 versus control cold.